Gravity is working against you as you drift in this vertical scroller. I seem to like avoid the wall games. I wrote many of them over the years, inspired by other games I played like �Cavern�s of Mars.� It isn�t a surprise as the ZX81 made it pretty easy to write a vertical scroller. For Death Maze, I added a little twist. Is it enough to make the game fun to play? Let�s find out. Right at the start, I expose the twist in the initial instructions. Using Z to go left, . right, and M to brake. Wait. What? Yep, the game is going to make you manage your drift. It isn�t a huge change, but an effective one. Unlike Stick Shift, you don�t have obstacles, shrinking walls, or artifical speed changes. Instead, you drift towards the bottom. This drift is where the challenge kicks in. Because you are moving faster than the walls, you have to be careful you don�t run up against a wall two spaces down. Thus, you have to stay ahead of your speed or brake. Braking and drifting work quite well and make the game both fun and interesting. You get more points the further down your are. Braking reduces points as you move up again. Also, you could drop to the very bottom, avoiding the whole thing. But keeping your ship, which is much wider than my other games, away from the walls can be quite a challenge. The odd part is the name. 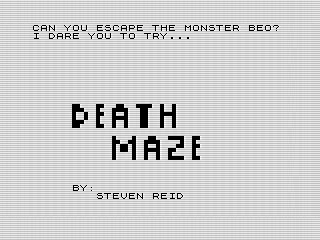 Only a few of my games bothered with title screens, but Death Maze has a decent one. Yet, it doesn�t fit. I mean, sure there is death, but where is the maze? It can be a bit of a let down jumping into a scrolling wall game. Death Decent or Death Drop would have been more descriptive. There is also a homage to another program in the description. The monster Beo hints to my talking head from Beo One. Although the floating head could be kind of monstrous, he cats more like a friend. Guess you typed some mean phrases that caused him to lock you in a ship and drop you into his death maze. Name aside, the premise isn�t bad. Some minor tweaks to the story would have set it up better, but the mechanics are there. The only minor nit is that each wave doesn�t have a clear end. You play forever with no real escape. Having a reason to keep returning to the maze, such as saving trapped souls or the like, would�ve been a better option over straight survival. The program itself is fast and clean. A good chunk of it is that title screen. The wonderful, yet flawed, SCROLL command makes the game work. I used a simple FOR loop to manage the wave, and some simple math to cause the drift down or braking back up. No big tricks here. The validation routine is the tricky. Because the ship is three characters wide, I have to check each space of the new position for a hit. Although it adds a bit of delay, the game is still quick. The drift helps, making it feel faster than it is. Although I didn�t adjust the game play, I made a few minor changes. Beyond the run after save, I made sure the game would restart once you die. This is the standard stuff I do for each game that isn�t already written that way. But, while adding that routine, I thought it odd the ship hovers once you crash. A such, I added a mangled wreck. It was an easy fix that makes for a better ending. The other tweak was to cover a minor cheat. A notable hole in both my other wall dodge games, you start above the walls allowing you to move outside of them. It is a gamble as the game could push you against the side, but still a cheat. To fill that gap, I added a wall to the first scroll that will cause you to die if you hit. I worried that the drift routine would allow you to still skip it, but in my testing I couldn�t avoid it. Plus, it now looks like you�re defending into a pit which is pretty cool. Only other tweak would be that goal at the end of the wave. And there you have it. A great little game that is both fun and challenging. Not super hard, but difficult enough. Like most of my games, it could be better with a little more thought. But, the core content is solid.